Trippy Crooked Illusion...With BONUS Afterimage! 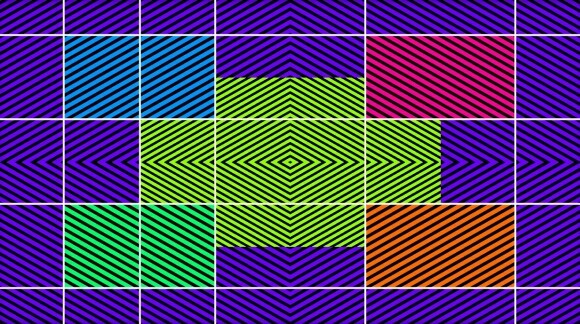 Trippy Crooked Illusion…With BONUS Afterimage! My eyes hurt and my head is swimming a little this morning. The culprit? This funky, trippy crooked illusion! And, I was feeling nice enough to share this gut wrenching, eyeball popping crooked illusion with all of you! Don’t you feel special? There are so many wonky things about this image that I’m not even really quite sure where to start. So, let’s start with the colors. Can I get an “OMG”? The bright clashing of colors in this image is about enough to make me wanna bang my head against the wall. Next up, the black lines. Holy cow! They look like they’re moving and pulsating to me! And, speaking of the lines, let’s address the whole crookedness of this illusion, shall we? If you’re a regular follower of this site, you probably already know what I’m about to say. That’s right—nothing in this image is actually crooked. All of the boxes are made with straight lines and parallel to each other. It’s just the lines that make them look crooked. Can I just say that that was probably one of my bigger mistakes of the day. I now have a headache and I have is the afterimage of this crooked illusion burned into my eyeballs. And, to top this off, it didn’t help me show that nothing was crooked in this image. The white lines just made it worse! Love this trippy crooked illusion? Head over and check out this simple crooked lines illusion too!